Spring overwhelms me. I attribute this to trees coming out of dormancy with such vibrancy. It is difficult not to notice the curtain of green envelop you, particularly on wooded lots. The green is not just overwhelming in color, but also in volume. Once wide open views become views into the color green and your vista contracts from expanse to the tree nearest to you. In the southeast, we are often exposed to this shocking transition in our surroundings as the Southeast has many, many, deciduous trees. This in opposition to the wide open vistas I grew up with in the West, so it is not surprising that my initial reaction to the spring tree phenomena is one of being closed in upon. However, having lived in the southeast for 20 years, I have been able to temper this initial reaction with one of wonder. The wonder of green, of tree's abilities to spring forth such massive amounts of energy, and simply the wonder of trees. The contraction also has the affect of turning your spirit back towards you, creating a feeling of introspection. Trees shade us, but also impose their wills into the space around us in the form of leaves and green. It is as if a waterfall of green spouts out of nowhere and immerses you into it as if you were swimming in a lake. I take this annual rite for what it is, and try to swim and splash within it without the panic of losing the vista around me. Big Tree? Be sure to look down! While it is natural for us to look up and perceive the tree from above ground, an even more impressive portion is below ground. Think of the first tree you drew, did it even have any roots? "The roots within the dripline of a tree are estimated to have 2.5 to 4.5 times more surface area than do the leaves (one side) of the tree according to Richard Harris in the Journal of Arboriculture (18:1, January 1992). More recently, it has been discovered that the ideal ratio of root to leaf surface area for photosynthesis is 10 to 1! Because most roots are veiled by a layer of soil we simply cannot properly conceive them in our minds without some serious intention. Upon closer examination we see a massive network of subterranean and superterranean organs that interfaces with the soil and mycorrhizae to absorb water, oxygen (from pore space) and minerals creating the engine for photosynthesis. Most of us know that the mushroom is simply the fleshy fruit of a huge network of roots or mycelium. Similarly, the portion of a tree above ground is the fuel to run the engine. Like us, trees are mostly water, and that water delivery system starts in the soil. A seed starts with the roots that snake through the earth absorbing water and elements to sprout the beginning of the tree above ground. For trees, our understanding of their full structure, including that below, is essential for their health. Too often, particularly in urban areas, roots are trenched, compacted, and removed without the full understanding of its impact on the whole tree. The misunderstanding is acerbated by trees' ability to store energy and live, albeit compromised, for years after the point of contact. While looking up is exhilarating, it is important to remember the heart of the mater is beneath our feet. Urban trees and green infrastructure have new competition. The concept of complete streets is to provide access and travel for all users, including pedestrians, bicyclist, motorist and public transport users of all ages and abilities. This movement has become very strong over the last few years. In my small town of Decatur, GA several streets have already been redesigned with complete streets in mind (see photo below). Yesterday I attended a bicycle rally at the capitol in Atlanta, GA where people chanted "complete streets" over and over again. The problem is that trees are rarely considered as part of the complete street despite many studies that outline the benefits of trees as a source to slow traffic and off set excessive storm water via green infrastructure. After placing the recreational pathway, sidewalk, cars, parking, and bike lanes, there is little room for trees. Are complete streets and trees incompatible? Decent overstory trees need the space to grow. Solutions might include bulb outs in place of a parking places and bridging roots under the sidewalks. All the same, it is important to design complete streets with trees in mind, otherwise we will end up with highways of imperviousness that provide no vertical element to slow traffic and provide little shade. 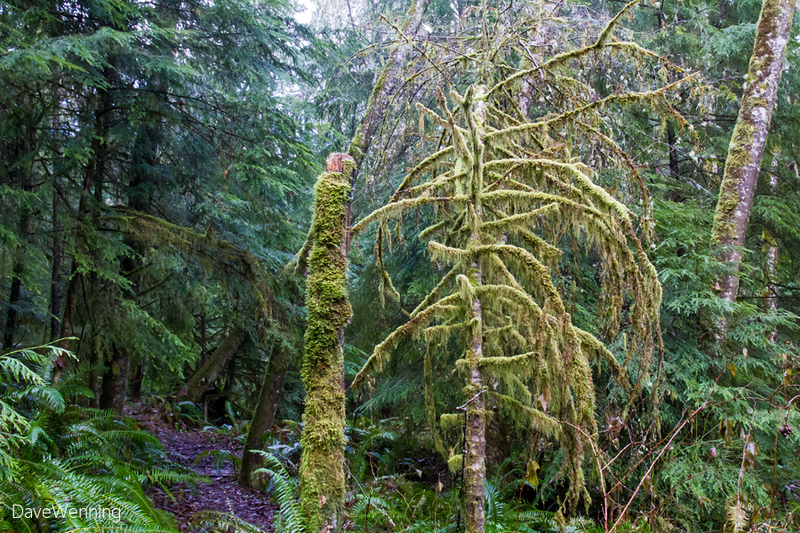 I found a temperate rain forest inside the Olympic Rain Shadow. This is a zone at the north end of Puget Sound in Washington State. Weather systems off the Pacific Ocean will dump most of their rain on the southwest slopes of the Olympic Mountains. This creates an uncharacteristically low rainfall area on the northeast side of the range. Deception Pass State Park lies inside the rain shadow. It receives only about 20 inches (51 cm) of rainfall annually. This is about half of what Seattle experiences. Most of the park is old-growth, dry coniferous forest. 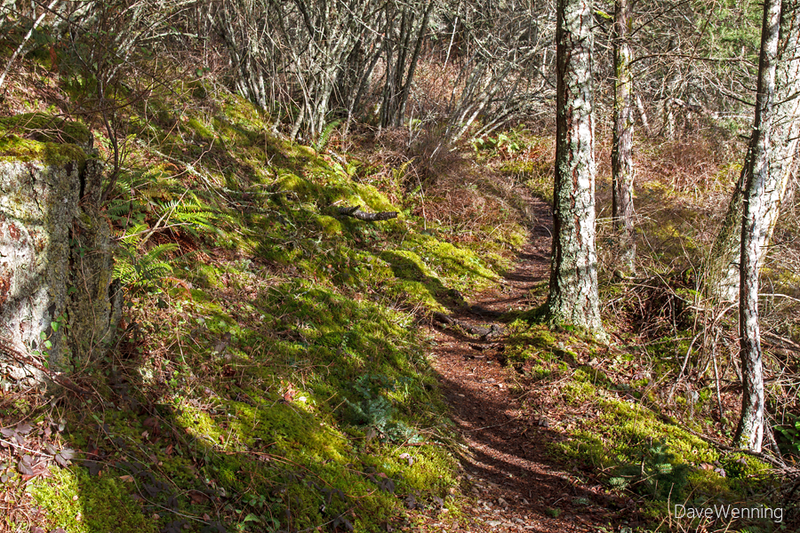 The Ginnett Hill Trail is a mile-long spur off the Pass Lake Loop Trail in the park. The trail drops into what has become known as Naked Man Valley before rising to the top of Ginnett Hill. The valley creates a basin between Pass Lake in the state park and Lake Campbell. I was not prepared for what I would find here. This trail is more primitive and less trodden than others in the park, but what a delight it turned out to be. The trail starts out looking a lot like others in the state park. 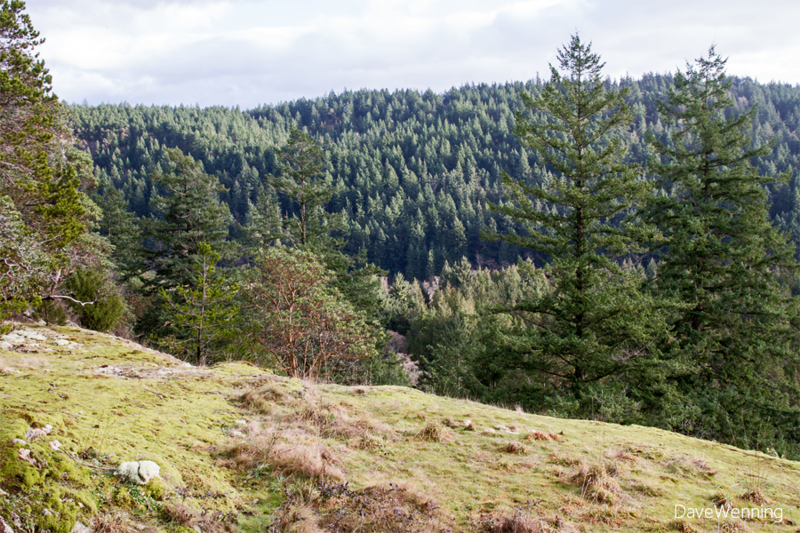 Douglas Fir, Grand Fir and Western Redcedar are the dominant trees. 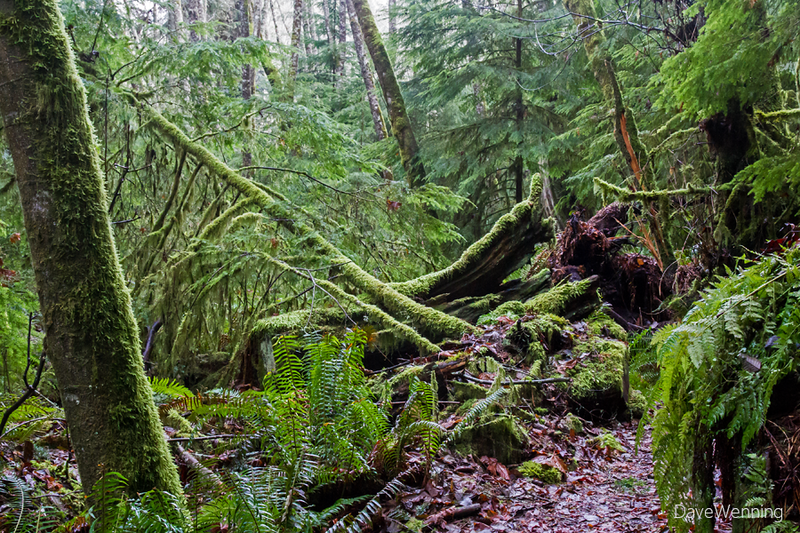 The forest floor is carpeted with Western Sword Fern, Salal and Mahonia. As I continue down into the valley, a lot of moss begins to appear. 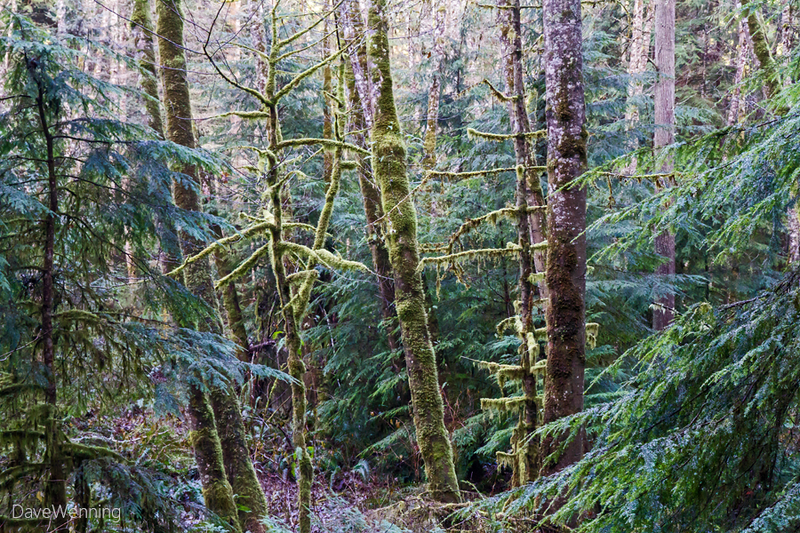 There are also more Western Hemlocks indicating wetter conditions. I start to see water flowing everywhere. In one spot the trail itself has become a small waterfall. Even though the state park lies within the Olympic Rain Shadow, I am entering a classic Pacific Northwest rain forest. When I reach the floor of the valley, I suddenly realize I am not alone in this forest. Could this be the naked man for whom the valley is named? Giant insects lie in wait near the trail. Could they be a threat to hikers? Enormous saurian reptiles stalk this Bryophyte world. A bit off the trail, gargoyles sit stoically as if in a vigil, keeping watch over the kingdom. In the deepest part of the valley, illusions become real and reality is just an illusion. Another sentry beckons me to continue swiftly on my way. From behind the trees, I am watched like a trespasser in an alien world. This must be royalty dressed in such fine clothing. A religious edifice reaching heavenward dominates a clearing. It is a reminder to be respectful and a good steward of this sacred forest. As I climb out of the valley a shocking scene comes into view. Something terrible has happened here. Now I know why the world below seemed to be wary of my presence. 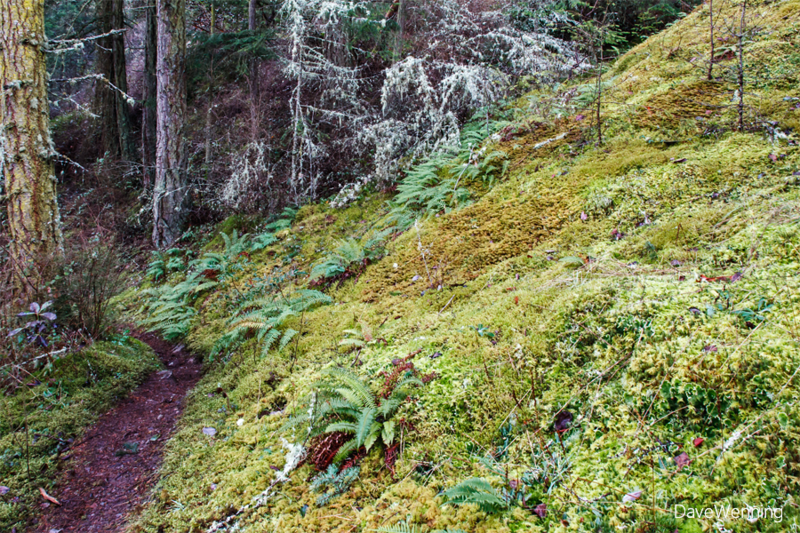 Continuing upward, entire hillsides next to the trail are covered with moss. As I get close to the top of the hill, the canopy begins to open. There is more sunlight and the vegetation changes. 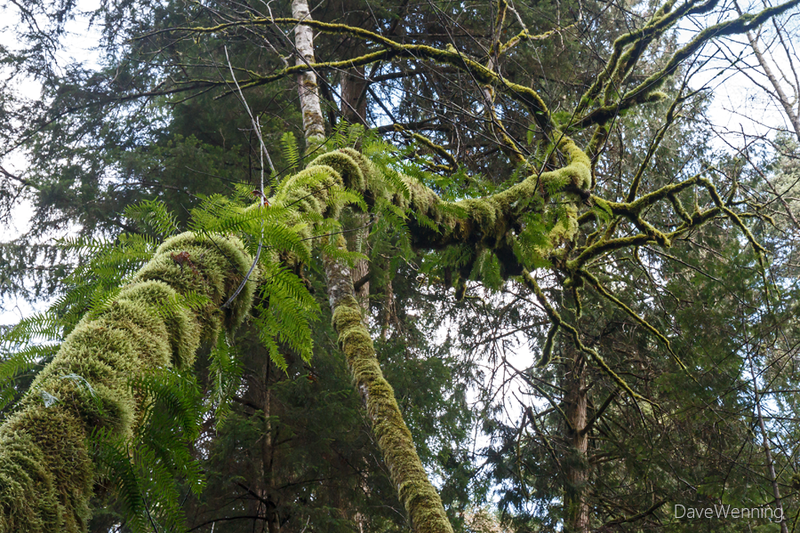 There are lots of Madronas, Salal and Mahonias growing with the moss. I am returning to drier, rain shadow conditions. Nevertheless, the moss still rules in this kingdom. Do you have tree information to share? Are you a tree blogger or photographer? Share your tree content on American Grove or your State Grove (only discussions, not comments) whether it’s a picture, video, event and/or blog. The three people with the highest ranking as determined by our website’s algorithm will receive a $50 Home Depot card plus an American Grove coffee mug and/or T-Shirt. To measure top content, the algorithm looks at a combination of quantity and quality, taking into account things like visits, shares (Twitter, Facebook, Pinterest) and who knows what else! While unpredictable, it is completely independent and I have found it to be a good measure. The only rules are that the content must be tree-related, subject to administrator approval, and posted after August 20th. The information does not have to be original, but must list sources. The top 3 on September 4th will win. Share your tree content now! Below are some quick links to post your content and the current top content board. 2. Post an original blog or share information you think we will enjoy. 3. Post a discussion item on your state grove. 4. Post an upcoming event. 5. Post or repost your favorite tree video. Over the years, a variety of assessment tools have been developed to help us better understand the benefits that urban forests provide and to quantify them into measurable metrics. The results they provide are extremely useful in helping to improve urban forest policies on all levels, inform planning and management, track environmental changes over time, and determine how trees affect the environment, which consequently enhances human health. Trees in cities, a main component of a city’s urban forest, contribute signiﬁcantly to human health and environmental quality. Urban forest ecosystem assessments are a key tool to help quantify the benefits that trees and urban forests provide, advancing our understanding of these valuable resources. That’s why American Forests is providing a step-by-step guide to urban forest assessments with a list of available tools and technologies. For more information on American Forests’ urban assessments resource guide and other urban forest work, please visit www.americanforests.org/urbanresourceguide. The soil was alive, the trees emanated old age, and the shade was prolific with pockets of light bursting through. 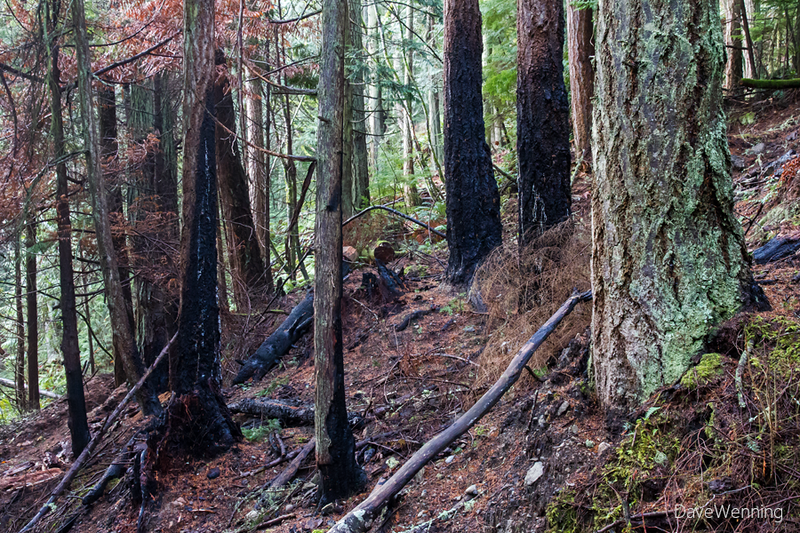 All expected qualities of an old growth forest. 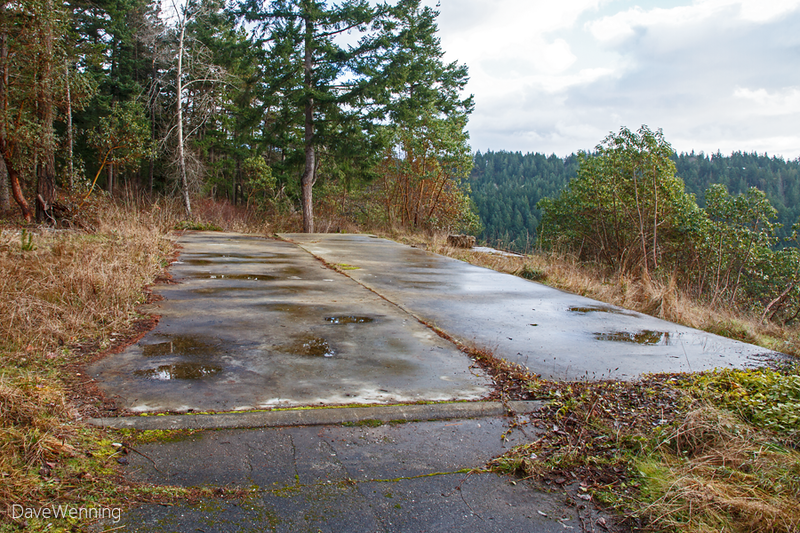 The unexpected was the sound of airplanes overhead and cars from a nearby major road. This was my experience at Big Trees Forest Preserve located smack dab in the middle of one of the busiest sections of Atlanta. More amazing is that, of the six million inhabitants surrounding the forest, I saw one person on a walk with their dog and another eating lunch at the entrance. Adjacent to the forest are office building and strip malls that are full of people. The contrast of the hot parking lot at the entrance and the cool breeze in the forest was tactile. Entry into the forest felt as if you were transitioning in time and space to a different reality. The forest was a perfect combination of neglect and love. Neglected by the general populous but observably cared for by those that love it with fantastic trails, maps, and informative designed viewpoints. These hidden gems are not as rare as you might think. I can count ten similar forests that I know of in the Atlanta Region. 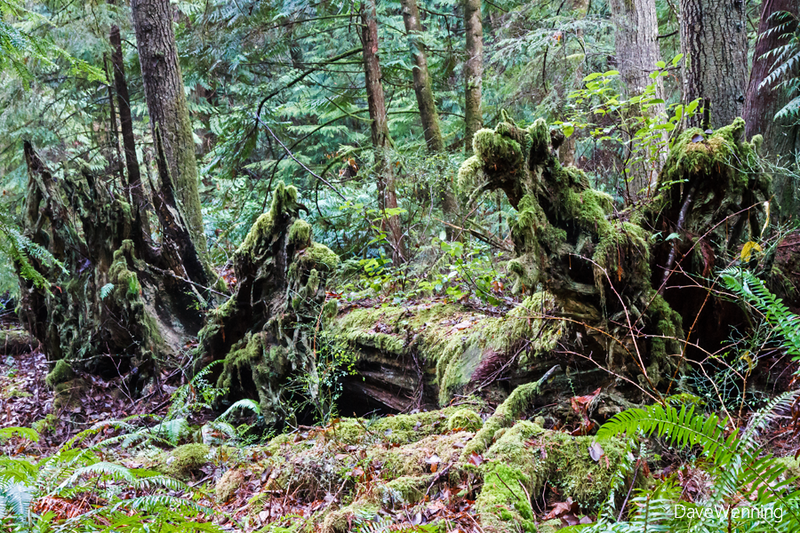 Have you discovered the secret forest in your area yet? Who founded National Arbor Day? National Arbor Day is less than two weeks away and communities and individual tree enthusiasts across the country are gearing up for the celebration. But where did it all begin? Believe it or not, the inspiration for Arbor Day came from a state usually associated with the Great Plains – Nebraska, one of our newest members of The Grove community. Check out the full history of National Arbor Day here. For the secular in Israel, it is similar to Arbor Day in the United States. Historically, it has been celebrated for over 1000 years and marks the time of year for calculating when the agricultural cycle began or ended for the purpose of biblical tithes. It is considered a "new year" celebration and is one of 4 new year celebrations in the Jewish Calendar. In the sixteenth century, the mystics of Safed associated the tree of the fruit-year with the S’phirot or Kabalistic Tree of Life. Thus, Tu B’Shvat is the day the Tree of Life renews the flow of life to the universe. Do Trees Contribute to Your Allergies? At the partners in community forestry conference there was lots of discussion about tree pollen allergies. In a discussion I had after the conference, a plant specialist stated that the yellow pollen released by pine trees is too large to impact most humans. Most doctors do not test for it in the allergy test. It is mostly the very small pollen invisible to the human eye that creates human reactions, and it turns out that the pollen counts are acerbated by the selling of male plants in urban areas, which it turns out most people prefer because they are not messy or smelly (many female trees produce fruit and occasionally an odor). It should also be stated that the pollen is often produced not by trees but small plants like ragweed. Have you tried American Grove Mobile? 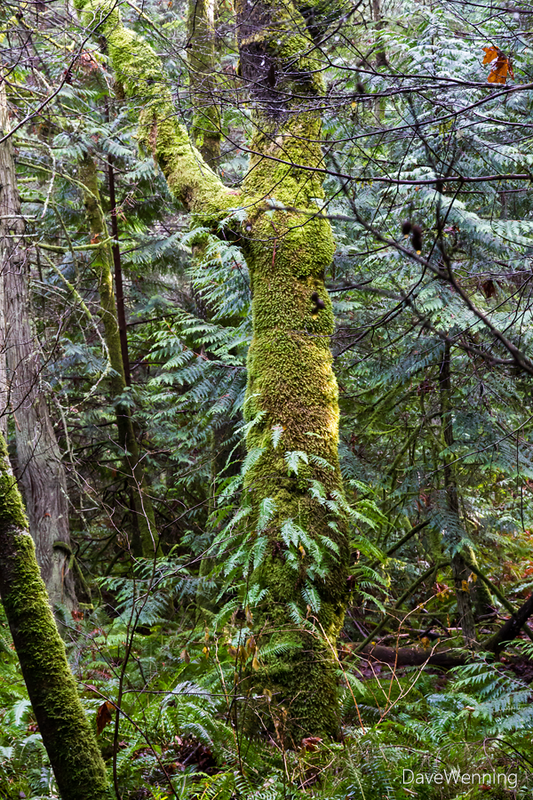 Easily view great tree photos or post one of your own using your smart phone. You may access by going to http://thegrove.americangrove.org/m or if you have an Android phone download our new App that accesses the mobile version with one click by clicking here or on the graphic. Using the mobile version you can also access your state group, top content, and discussions in a super convenient format which in many ways exceeds the desktop version. Share your tree passion and help us motivate others to plant trees! American Grove has a new interface and we think it is pretty awesome. All smart phones will automatically route you to the mobile version as it uses the screen much more efficiently. Some features are preferable to the desktop version, like the photo view. If you have a tablet, the desktop version will be the default, but if you want to see the mobile version on your tablet or desk top simple go to http://thegrove.americangrove.org/m. It is simple to toggle between the desktop and mobile version by going to menu icon in the upper right (unfortunately, because it was designed for phone browsers the menu icon shows up as a black box in the upper right using internet explorer). The Kentucky Coffeetree provides great diffuse shade in the summer, but its spare branching allows light and warmth into your home in the winter.This legume fixes nitrogen in the soil, and the compound leaves filter light, allowing a thicker, greener yard. It is considered highly storm damage resistant, so is a good choice to plant near buidlings. Each year holds new surprises for me as the Forest Health Program Leader for the IDNR. Last year we battled with Imprelis lawn chemicals killing conifers. The year before we had Arborvitae dying without a common theme, and we still do not know what caused it. We constantly monitor for oak wilt, bur oak blight, gypsy moth, Asianlonghorned beetles, emerald ash borer, and Thousand Cankers disease of black walnut (to name a few). This year brings about a new question. Many garden stores are offering mulch with weed preventer added. We all know the benefits of mulch: conserving moisture, adding organic matter back to the soil, and preventing unwanted plants from competing for the available water and nutrients. As any faithful mulcher knows, the weeds that do grow in the mulch are very easy to pull out compared to a non mulched area. However, I am a bit concerned about adding an herbicide to the mulch to keep the weeds from growing in it. As I read the labels on these new mulches, I see that the targeted weeds are largely broadleaves, not grass, and they are controlled through both premerger herbicide and time released herbicide. Let’s keep in mind that the tree you are mulching around is a broadleaf. I cannot help but wonder that if I used this mulch around one of my trees, would I not be adding a new stressor and removing some of the benefits of mulch? After all, that tree is once again a broadleaf. Will the chemicals volatize? If so, that airborne chemical could have some impacts on sensitive trees such as redbud. These products are so new that we do not have a good feel of what level of damage, if any, would be caused. I would suspect that younger trees would be impacted more than older trees, but I still do not see the benefit of adding the herbicide. I will keep a watchful eye on this to see if issues emerge. Right now, we are planning to mulch around young nursery stock with two different mulch formulations and one without weed preventer to see if there is a difference. If you have already seen some issues, please post them. I would love to know about them. Have a great summer. Of course, not all mulch is equal. Coarse woody mulch seems to have the most benefits and living mulch (e.g. turf) the least. Negative consequences of coarse woody mulch are close to non-existent. There is the small possibility it could transport an invasive plant and/or pathogen, but mulch is generally inhospitable to such invaders. It turns out mulch also protect soils from extreme temperatures in that soils can be kept cooler in hot conditions and warmer in cold conditions. Other important benefits described in the paper are that mulch provides needed soil nutrients, protects soil from compaction, and control against pests and abiotic syndromes like lawn mower damage. Now you understand the magic of mulch, so go out and MULCH! Sometimes, urban trees must be removed. When this occurs, it is more desirable to utilize this wood as opposed to hauling to a landfill. The trees can be milled by local sawyers and dried in small kilns to be used for furniture, flooring, etc. At Watson Springs, we find very unique woods in urban settings. Just look at the "Rainbow" poplar that was removed from a yard, saved from the burn pile and turned into these beautiful step treads.